MKR Sun – Will the Russians bomb? The Russians are here. Apparently we are meant to hate them when really they just call a spade a spade – albeit with a fluctuating accent that is sometimes a little Blofeld. Can they cook or were they cast to be the baddies? So far in this group we’ve had great cooks (Team Tassie), guys we know can cook but had a few flaws (Italian mates), and some half-okay cooks who are still better than most of Group 1 (ie, they know what a colander is). Time for a team to bomb? Love the puppy – thanks Juz! “Accents” are all over the place! How long have they lived in Australia? It was interesting listening to them and hearing the Russian accent slip every now and then. The girls say meat is very important in Russian cooking – note they are not shopping in Coles. Entree is some kind of jellied meat terrine using pig trotters the butchery has labelled as “dog treats”. Dessert is a White Russian – a spin on the cocktail, involving white choc and copious amounts of alcohol. It’s a glass dessert so less can go wrong, plus the ambiguous name means they can skip elements and no-one will know. Crew doing their bit to stuff them up. Short of one cabbage roll. Oven not working properly. At least they can cook. The drama begins early with Hadil Aka Man Eater 1 snubbing Olga aka the White Russian as they arrive. Olga plots her revenge by planning small portions for ME1, which they would have been getting anyway. I love Henry and Anna even more because they scored fairly and not strategically. The girls have not cooked enough cabbage rolls and some are dodgy looking. Why oh why did they not make 10 extras? Not allowed to do so? Should have cooked the rolls in two smaller pots to control the heat better. Girls are not happy but Pete still loves it. Manu says again a little under seasoned. Everyone forgets chefs have a huge tolerance for salt. Quick question for people paying more attention than me, because I missed it. Are Olga and Valeria Russian? Channel 7 didn’t really make it clear, so I’m a bit confused on that point. Anyway, at least they can cook. The meat jelly looked quite a bit off-putting, but the main and dessert looked pretty amazing. They’re both still just a little annoying, though. Moscow Marron w/ Solzhenitsyn Soz. etc to further ram their ethnicity down the viewers’ throats. Ch 7 tried hard to make me hate them but what the hell , they can cook. Everyone loves it bar Man Eaters. 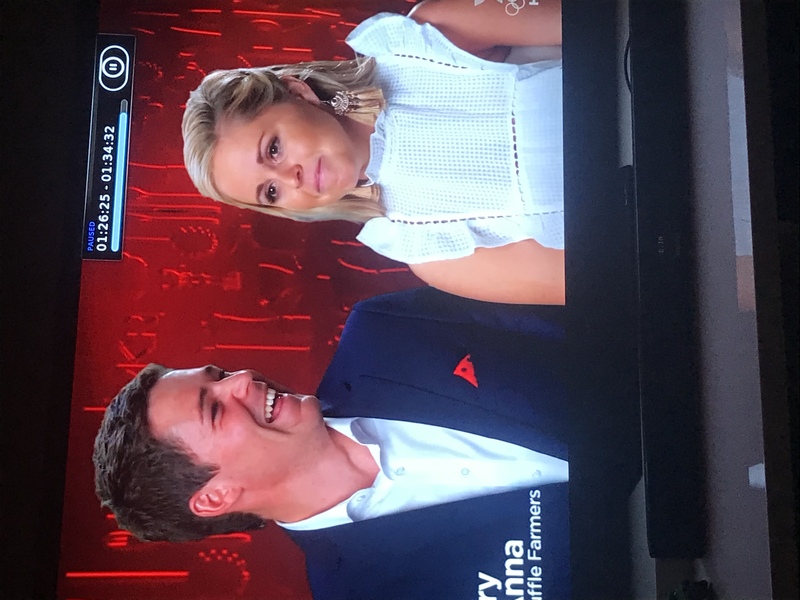 I love, love Anna but why has wardrobe dresses her in a pinny that’s like a tissue poking out of a box? Very, VERY unfortunate/poor choice of wardrobe. Makes her look flat as a pancake and it appears she has no neck. Anna and Henry score a 9; military 7; mates 6 (some game playing there); sisters 8; in laws 8; mum 9: MEs 6. Not sure how the Russians will go in a public challenge but they are great at the food they know. They beat Henry and Anna by one point. Yay – more people who can cook! Tomorrow it’s off to Coffs Harbour for the sisters to cook. I HATED it when I was a kid.^^ Never enjoyed cabbage, unless it was red cabbage with apples. I am happy they did well, I do not really like the man eaters. Coming from a Russian background myself and growing up on Galouptsi and Chaladyets couldn’t believe they did these dishes. Firstly I’m suspect on how good they were, as their style of doing it was quite different to my grandmothers recipes. With the cabbage roles my gran would boil them in a tomato based broth (and generally being jewish used beef/chicken as the meat), with the chaladyets they must of used gelatine for not sure how it would of set using the natural gelatine within the bones. Also considering they are bakers surprised at the choice of dessert, lots of fine russian cakes they could of made. In the end well done to them, but you can see how much cooking experience (professional) they have… look at their knife skills and organisation.. also helps that russians tend to cater for large groups too. Not sold that their menu was better then the Tassies, but congrats and looking forward to the nasty Chinese Take Out girls and Jordanians getting some bad critique. It was pretty awful when the Chinese restaurateur’s daughter was saying Dad always taught her to be the champion, to the best. Avid followers of Battle Hymn of the Tiger Mother. Not conditioned to lose so hope for their sake all goes well. Not a fan of the Russians but at least they can cook. My mother made rolled cabbage but I didn’t like it and wouldn’t eat it. She also put beet and horseradish sauce on a few things. That dessert looked a bit on the small size to me.